This image began with a snapshot that i found this morning. I was looking through a big envelope of old photos that my aunt sent me a few years ago. Most of these pictures are of my mom before she got married. This photo is labeled "Ruth - SF. 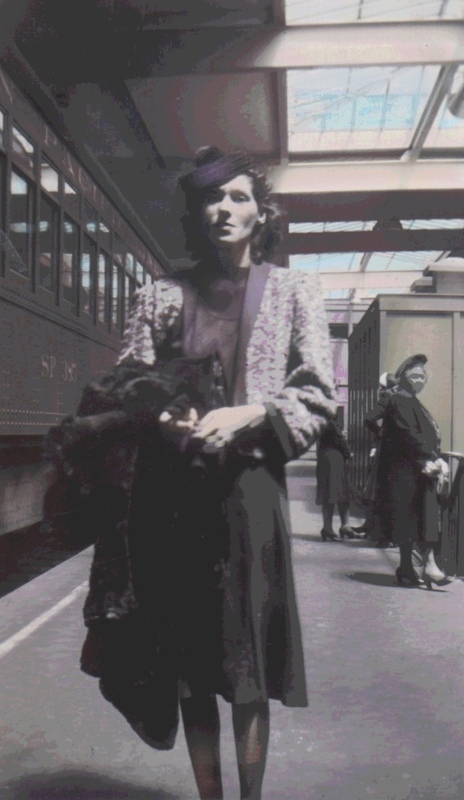 Terminal - Aug. 1940". So my mother went to San Francisco. I think the photographer was my mom's sister because I also saw pictures of her in Berkeley, California, labeled "Aug. 1940." I will have to ask. Anyway, I love this picture of my mom, looking very elegant. This morning I cleaned the image up a bit in iPhoto and then opened it in Painter. I used digital pastel, color overlay, and selective posterizing to add color. It is fun to imagine the colors. I like the result and its nice to feel like I am spending a time with her. I am posting this today because she was born on November 2nd.